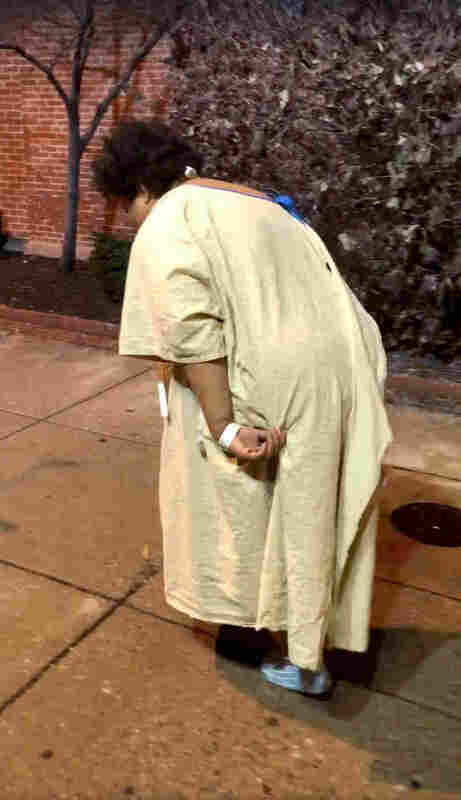 Federal Regulator Cites Baltimore Hospital After Patient Left At Bus Stop In Gown : The Two-Way The investigation by the Centers for Medicare & Medicaid Services found that the hospital failed to protect the patient from "harassment and potential harm." A woman discharged from a Baltimore hospital, later identified as Rebecca, was captured on video by passerby Imamu Baraka. A federal regulator has cited a Baltimore hospital for breaches of federal regulatory requirements, after a passerby shot a video of a confused patient in a hospital gown being taken by guards to a bus stop on a cold night in January. The disturbing video prompted broader questions about the University of Maryland Medical Center Midtown Campus's treatment of emergency room patients. The investigation by the Centers for Medicare & Medicaid Services found that the hospital "enacted barriers to patients receiving care in the Emergency Department, failed to discharge a patient in a safe manner from the Emergency Department, and failed to protect one patient from harassment and potential harm." The hospital said it has already put in place measures to correct these problems. "We take responsibility for the combination of circumstances in January that failed to compassionately meet our patient's needs beyond the initial medical care provided," Karen Lancaster, a spokesperson for the University of Maryland medical system, told NPR. "We pledged to our community and patients to do and be better, and we are confident that we already are." James Farmer, a personal injury lawyer representing Rebecca, said the family "is happy that an investigation has been done and this incident has been brought to light." "We do not want to see this happen to anyone else," Farmer told NPR. "This example of patient dumping shows a lack of common human decency and empathy." CMS said it launched the investigation after media coverage of the incident, and the investigation provides new details about what happened before the patient was discharged in the cold. "The woman is standing next to the bus stop in a thin yellow hospital gown and socks. She appears scared as she staggers and softly mutters. Several bags of what appear to be her belongings are sitting at the bus stop. The woman moans and cries and coughs, and her breath forms white clouds in the cold. "Baraka calls 911, and rescue workers arrive quickly. They take her back to the hospital where she was discharged just moments before." At a press conference in January after the video was released, the patient's lawyer said the video shows her in a state of "acute psychosis," and her mother Cheryl Chandler credits Baraka with saving her daughter Rebecca's life. She said the hospital sent Rebecca to a shelter, where she later found her. "My daughter did not choose to be the face of mental illness. She didn't choose to be an example of the impact of a failed mental health care system," Chandler added. According to the federal investigation report, an ambulance initially took Rebecca to the ER "with a head injury from a fall off of a motorized bicycle." She was "triaged, examined and medically cleared for discharge by medical staff," according to the documents, adding that she was "resistant to discharge and refused to get dressed into street clothes when requested by nursing." At this point, according to the hospital, there was a "communication failure" about the patient's discharge plan. The nursing staff case manager had "arranged for the safe discharge to include a taxicab transport of the patient to a shelter." But after Rebecca became "resistant to going," the federal authorities stated, nursing staff asked for help from security staff. She was then "given her belongings escorted out of the ED by security staff while wearing only a hospital gown and socks to a nearby bus stop and was left there in approximately 30 degree Fahrenheit weather," the investigation reads, adding that it was not clear whether nursing or security staff made that decision. The way Rebecca was discharged means the hospital neglected to keep the patient safe from harm, the regulators found. The hospital says it is re-educating staff on the federal regulations, including security guards. The hospital spokesperson also told NPR that they have "taken appropriate personnel actions," without elaborating. "A family who loves her"
While UMMC has stated that the "safe discharge" plan involved transferring her to a shelter, her mother has made it clear that Rebecca is not homeless. "Rebecca has insurance. Rebecca has a family who loves her dearly," Chandler said at the January press conference. The federal regulator also cited the hospital for failing to post signage in the ER that listed patient rights, and for failing to maintain a complete emergency room log. It also said that the hospital failed to give every patient who presented in the ER a medical screening exam, as is required by law, and failed to "give unencumbered access to the emergency department for every walk-in patient." Additionally, CMS said that the hospital was not in the habit of creating a new visit record when a patient returns within two hours of discharge, as was the case with Rebecca. UMMC said that the federal findings are "largely consistent" with what they found in their own internal review, along with an additional audit they commissioned from an outside firm. It said it has "realigned reporting structures" across two hospitals to "optimize safety, quality and patient experience."